Using crystals to aid in psychic protection can enhance the aid of the psychic. Crystals are elements that contain energetic properties. Crystals can have the ability to heal spiritual lives and bodies. They can do this by correcting an imbalance of vibrations in the body. 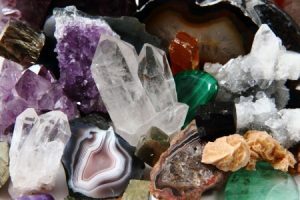 If the user is experienced or a beginner, healing crystals can help tap into intuition or psychic ability. The so-called ‘Psychic Gemstone’ is the Moonstone. This stone enhances intuitiveness and is an especially helpful tool for those using tarot cards, runes, pendulums or crystal balls. Moonstone is thought to be a wish-granting stone and harnesses the energy and healing qualities from the moon. It is milky, white or creamy in color and often brings balance to the one who wears it. This particular gem is known for its ability to immediately heal and align chakras and auras. Kyanite helps to make connections with spirit guides and increases the ability of mental telepathy. The user can channel psychic abilities and intuition with this stone. This gem is perfect for beginners because it aids in the development of psychic gifts. Kyanite is most commonly a cornflower blue color, but there is also black Kyanite. It is also used for deep meditation and relaxation. This special gem has been used throughout history for protection. Ancient Greeks used this stone to ward off pain and mental imbalance. Today it is used to purify negative energy, enhance meditative states, and provide protection around the body when opening up to spirituality. Amethyst can lead to the development of creativity, focus, passion, intuition, and psychic ability. It is violet purple in color and is a member of the quartz family, and is especially important in the vibrations of the crown and third-eye chakras. This stoneThis stone is especially important in the contact of angels and spirit guides. Lapis Lazuli is very important to a psychic during a reading, as it prevents attacks from unwanted psychics. This gem is very powerful and should be used with great care. Throughout history, it has been used to contact the afterlife. Many historical figures have used Lapis Lazuli, such as King Tut, Catherine the Great, and Michelangelo. It is even referenced in the Old Testament. Lapis Lazuli helps to enhance and develop intuition and clairvoyance. The stone works directly through the throat chakra to heighten extrasensory perception. It is blue in color and is said to bring freedom from negativity, foster inner peace, bring a desire for truth, and activate the higher mind. Quartz is the most common stone in the world, but it is also very useful in the link to the divine. It is considered very powerful in expanding psychic abilities. It can enhance clairvoyance and has properties that allow for amazing psychic protection. Quartz is linked to the crown chakra, which is known for being the center of understanding and communicating messages from the spirit world. This gem has quite potent healing properties and magnifies the energies that surround it. Quartz is often called the ‘universal crystal.’ It is said that quartz opens the heart and mind to a higher purpose and allows spiritual forms to be transformed into psychical forms. This stone is great for heightening intuition and psychic ability. It is often called the stone of magic and legend by the Inuit people, who say that it fell from the Aurora Borealis. Labradorite is helpful in aiding in self-discovery and awakening awareness to the spirit, and it helps protect against misfortune. This gem also helps with telepathy and past life recall. Labradorite offers strong protection and is often used as a bridge to the spirit world. It is said to ground those who use it. This special gem grants strong psychic protection against negative energies and psychic vampires. Fluorite often aides in finding a higher consciousness, and can be a guide to the spirit world. This stone helps cleanse the user before meditation because it cleanses human chakras and spirit. It can often absorb negative energies and auras and harmonize spiritual energy. Fluorite is most often violet or purple in color, but it can be any color. Purple is often seen as a powerful color in psychic healing since it helps by focusing on one’s spiritual alignment. This stoneThis stone is helpful in psychic communication. It also enhances intuition and clairvoyance. Azurite can often times improve spiritual connections. It is a deep azure blue, which correlates to the brow chakra, associated with intuition. This gem goes hand in hand with the element of water. Its soothing and calming properties inspire a sense of letting go. Aquamarine can also aide in enhancing communication. This stone’s name literally means ‘water of the sea’ and is associated with mermaids. It is often times used by sailors to ward off evil and bring good luck. The gem is frequently used to connect to the moon, sea, and heavens that are mirrored on the water’s surface. Aquamarine helps to explore the soul, become aware of the truth, deepen meditation, and hasten the intellectual exploration of the self. This gem is known for enhancing intellectualism and brain activity. It does this by stimulating the pineal gland, which is where the third chakra resides. Dumortierite balances this chakra and is said to heighten psychic ability. It helps the psychic accurately interpret information. This is known as a centering and grounding gem. Many psychics believe bloodstone to be magical because it protects from evil. It also releases blockages from the body. It is dark, shiny green with spots of red in it, resembling blood. Bloodstone vibrates to the root chakra. This special gem can help with trusting in intuition and psychic ability. Carnelian can aid in transitioning between the physical and spiritual world, and it offers great protection. This is a great gem for balancing the sacral and root chakras. Its color is an orange-red. The crystal aids the psychic in clairvoyant activities. This stone is known for assisting in the prediction of future events and attaining a higher consciousness. Emerald can offer great protection from negative energies and evil. It is strongly linked to the heart and keeps those chakras flowing and in balance. This gem is important in aiding in clairvoyance and psychic ability. It helps to clear the mind of chatter, allowing for clear meditation. Snowflake Obsidian aids in balancing the body, mind, and spirit. The stone offers strong psychic protection and guidance to the spirit world. This gem is black and white in color and is a natural volcanic glass. This gem is especially helpful in opening up communication to the spirit world and helps to clarify messages from the spirit. It also helps with telepathy, out-of-body experiences, and precognition. Sapphire is often blue in color and is known for its powers of spiritual enlightenment.